The open-access journal Archives Animal Breeding (AAB) is now published by Copernicus Publications on behalf of the Leibniz Institute for Farm Animal Biology (FBN) in Dummerstorf, Germany. The focus of the international journal is scientific progress in farm animal biology. AAB already has a Thomson Reuters Impact Factor and will be publishing its 58th volume this year. 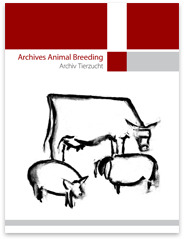 With the move to Copernicus, the peer-reviewed journal also changed its former title Archiv Tierzucht to Archives Animal Breeding. AAB authors will also benefit from Copernicus’ services such as English copy-editing by native speakers, professional production and fast publication of manuscripts, immediate distribution of the publication and its metadata to scientific databases, indices and search engines, as well as full-text XML for all new articles. More information on the Leibniz Institute for Farm Animal Biology (FBN).